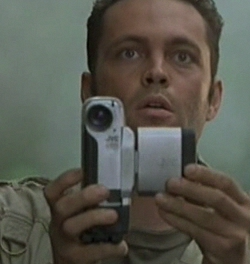 Nick Van Owen used a JVC GR-DVM1 compact digital video camera while on Isla Sorna as part of John Hammond‘s expedition team in 1997. The purpose of taking video footage was to prove the existence of the dinosaurs so that they could be protected. The GR-DVM1 features a high-resolution LCD color monitor, which enables clear viewing of both indoor and outdoor subjects thanks to the industry’s first polycrystalline-silicone TFT LCD color monitor.